Fig. 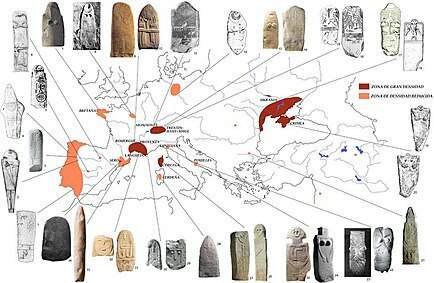 9: Map with statue-menhirs in Europe. Photos and draws: 1y 4.-Bueno et al. 2005; 2.-Santonja y Santonja 1978; 3.-Jorge 1999; 5.-Portela y Jiménez 1996; 6.-Romero 1981; 7.-Helgouach 1997; 8.- Tarrete 1997; 9, 10, 13, 14, 29, 30, 31, 32.-Philippon 2002; 11.-Corboud y Curdy 2009; 12.-Muller 1997; 15, 16, 17, 18, 19, 20, 21, 22, 23 Arnal 1976; 24 y 25.- Augusto 1972; 26 y 27.- Grosjean 1966; 34.- López et al. 2009. 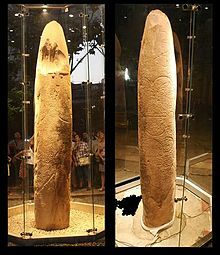 Iberian megalithic art contains the most number of realistic representations of objects, although there is also a strong abstract element. 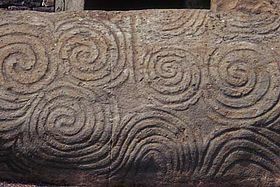 Iberia is the only place to have painted decoration as well as carved. Other areas may also have originally been painted, but Iberia's arid climate lends itself to preservation of the paint. The paint (as it currently survives) is normally restricted to black and red, although occasionally features white as well. ^ Peet, T. Eric (2006) [originally published 1912]. Rough Stone Monuments And Their Builders (PDF). The Echo Library. p. 81. ISBN 978-1-4068-2203-8.